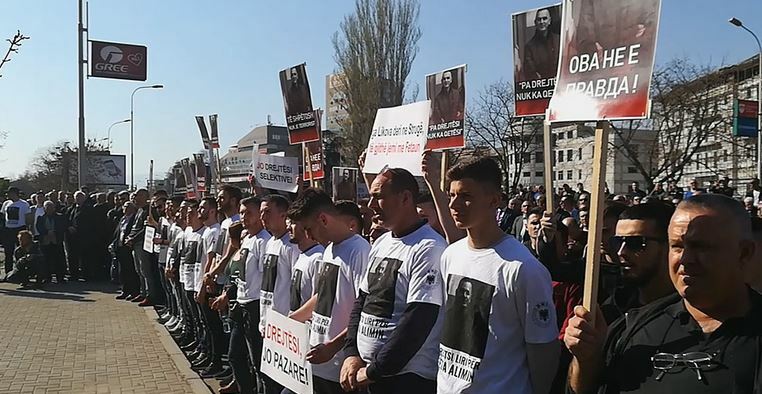 Albanian opposition leaders Zijadin Sela and Arben Taravari protested in front of the Skopje courthouse today demanding the liberation of Abdulfeta Alimi, a Parliament security officer who was sentenced to seven years in prison in the large April 2017 process. Although most of those sentenced to up to 18 years in prison for “terrorism” are ethnic Macedonians, supporters of the opposition or police officers charged with not doing enough to stop the unruly protest, Alimi is one of the few non-Macedonians caught up in the events. Among the members of Parliament attacked when protesters stormed the building angry at the irregular vote to elect former Albanian terrorist commander Talat Xhaferi as new Speaker, Sela was the one who sustained the worst injuries. He claims that Alimi tried to shield him during the incident, but prosecutors have charged him along with other security officers for not doing enough to insert themselves between the protesters and the members of Parliament. – No justice, no peace, saving a person doesn’t make you a terrorist, Albanian protesters chanted today in front of the courthouse. Prosecutor and Government loyalist Vilma Ruskoska responded to the protest saying that it was one of the protesters who shielded Sela from the attacks, and not Alimi, who helped him only later in the course of events. She insists that individual security officers should be held responsible for not trying to stop the protesters, even though they were badly outnumbered.